This Caldecott Medal-winning classic, which speaks of a timeless love and appreciation for life's gifts, is now available in this special edition for the 75th anniversary of its composition. Full color. - Publisher For sixty years children and parents have shared in the joy and inspiration of Rachel Field and Elizabeth Orton Jones's Prayer for a Child. This new edition commemorates the diamond anniversary of the award-winning modern classic's original publication. 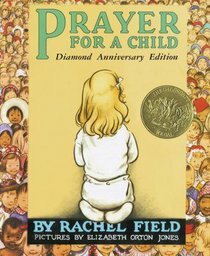 About "Prayer For a Child"
For sixty years children and parents have shared in the joy and inspiration of Rachel Field and Elizabeth Orton Jones's Prayer for a Child. Rachel Field wrote this prayer for her own daughter, but she now shares it with children all over the world. Her beloved children's books include Newbery Medal-winner "Hitty, Her First Hundred Years, Calico Bush, " and "Hepatica Hawks."